I do wish SpaRitual polishes were a little easier to come by because they makes some beautiful shades. As it is, you can purchase this online from their website priced at £8.50 for a 15ml bottle. What a gorgeous color, so striking! I don’t know about the colour, but I now have “Circle of Life” from the Lion King stuck in my head! This looks so pretty against your skin! It’s a far trip to the nearest salon that sells SpaRitual polishes but this blue might be worth it! Gorgeous gorgeous colour. it never crashes usually, pff. I love this shade. 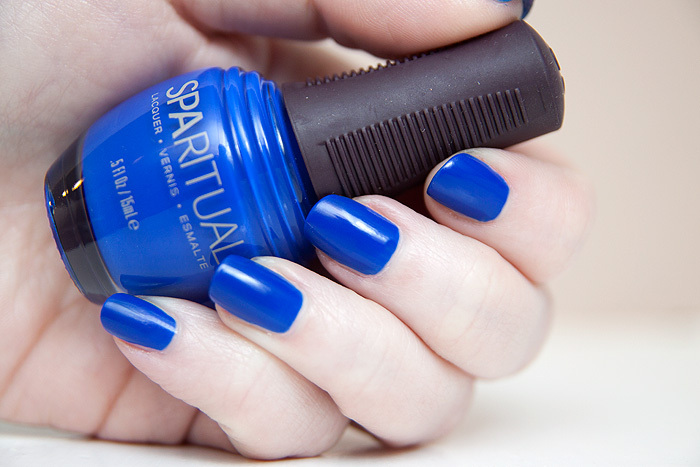 I am a big fan of sparitual, though I have difficulties obtaining their polishes. There is no distributor near me and I can’t find sparitual in my usual e-tailer shops. Since I am a huge fan of blues, I totally dig this one. And I love the way you do your photographs, they always look so clean and professional.